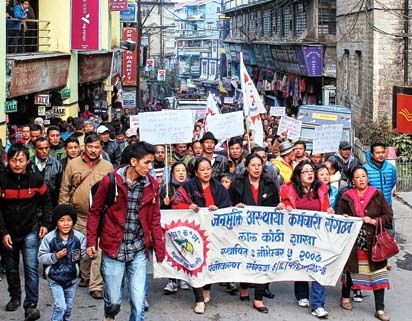 The Janmukti Asthayi Karmachari Sangathan (JAKS) today kicked-off its agitation in support of the demands raised by the 278-odd Gorkhaland Territorial Administration employees that include doctors, engineers, curators and managers from Kurseong, Darjeeling, Kalimpong and Mirik. The JAKS wants enhanced salaries for these employees as per state government norms. The demonstrations will be held outside Lal Kothi, the GTA headquarters, and is meant to disrupt the proper functioning of the council body until their demands are met. The pan-hills agitation has called upon five members each from Darjeeling, Kalimpong, Kurseong and Mirik to demonstrate every day outside Lal Kothi for an indefinite period. Similar programmes will be organised simultaneously in other sub-divisions also. The state finance department had issued Order No. 1107-F (P) dated February 25, 2016 to revise the benefits of contractual workers of the GTA, albeit on fulfilment of certain criteria. The order also stated that the state government would enhance remuneration by 3 per cent every year. Accordingly, the salary of Group C and D employees, some of whom have been working for more than 20 years, has been increased to Rs22,000 and Rs20,000 respectively. But the state government order does not mention the new salary structure of the Group A and B employees, or the doctors, engineers, curators and managers working in the GTA. “The state government order issued in February of this year is not clear as Group A and B employees have been left out of the new enhanced pay structure. This is gross injustice to the 287 doctors, managers, engineers and curators. The state government has failed to clarify its stand in spite of repeated reminders,” said Kishan Gurung, the JAKS general secretary. The non-cooperation on behalf of the Group A and B staff will continue indefinitely, unless GTA principal secretary Rabindra Singh convenes a meeting to address the matter. The Janmukti Asthayi Karmachari Sangathan (JAKS) today kicked-off its agitation in support of the demands raised by the 278-odd Gorkhaland Territorial Administration employees that include doctors, engineers, curators and managers from Kurseong, Darjeeling, Kalimpong and Mirik.